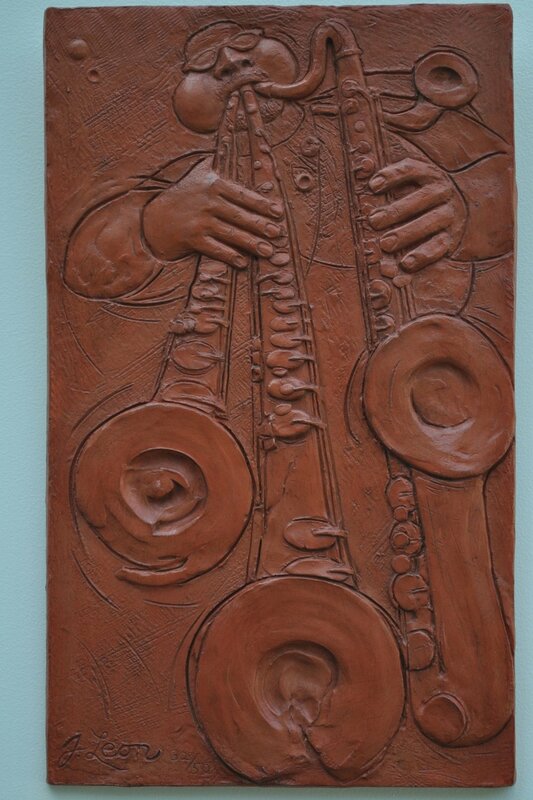 This bas-relief sculpture is of Rahsaan Roland Kirk, who was one of the first people that fired my love for jazz. He is also an inspiring hero to me, partly because of his ability to overcome the hardships in his life to do things considered impossible and, partly, because of the raucous and audacious creativity and passion in his life and music. Blind, he could play 3 saxes at once; was unsurpassed in vocalizing through the flute; & included flutes, clarinets, oboes, saxes, & trumpet in various combinations during performances. A cast of this is at the Ohio School for the Blind in Columbus where he was a student. Cast stone, edition of 50. 13 x 9 x 1 bas-relief.